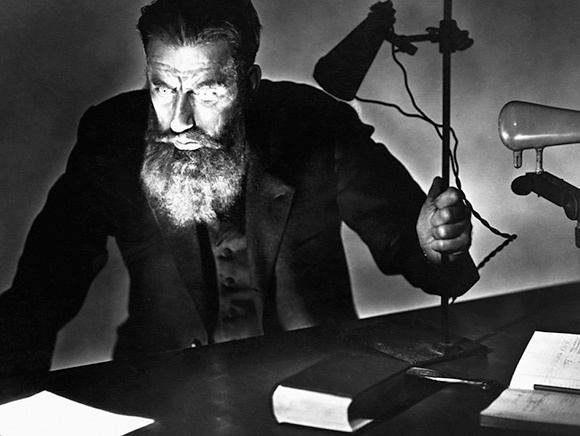 1895: German physicist Wilhelm Roentgen is working in his laboratory in Würzburg when he accidentally discovers the X-ray. Roentgen was conducting experiments with a Crookes tube — basically a glass gas bulb that gives off fluorescent light when a high-voltage current is passed through it — when he noticed that the beam turned a screen 9 feet away a greenish fluorescent color, despite the tube being shielded by heavy black cardboard. Roentgen concluded, correctly, that he was dealing with a new kind of ray, one that cast the shadow of a solid object when passed through an opaque covering from its point of origin. Not knowing what kind of ray he was dealing with, exactly, led him to call it an X-ray. The name stuck. To test his discovery, Roentgen made an X-ray image of his wife Bertha’s hand, clearly showing the bones of her hand and a pretty hefty wedding ring. In the next couple of months, Roentgen published a paper about his discovery: “On a New Kind of Rays.” He made a presentation before the Würzburg Medical Society and X-rayed the hand of a prominent anatomist, who proposed naming the new ray after Roentgen. You don’t hear them called Roentgen rays much these days, but the term roentgenology is still current, and the roentgen is a radiological unit of measure. X-rays are no longer a mystery, but a major tool of medical diagnosis. This article first appeared on Wired.com Nov. 8, 2007.